Harry Rawdin was recorded on the 1918/19 Bottesford list of Absentee Voters, his home address as The Green. He service identity was given, somewhat cryptically, as 5/16405 Sergt. 53rd (Y.S.) B.N., T.R. (NFS). Harry Rawdin was one of four sons of Thomas and Sarah Rawdin who all served in the army. The oldest, Sergeant Thomas Rawdin, fought in the Boer War and gained fame as the ‘Hero of Nitrals Nek’, earning the D.C.M. The others, Frank, Harry and Cecil all fought in WW1 and reached the rank of Sergeant. Harry Rawdin served with the Northumberland Fusiliers. After the end of the war he continued to serve in the army for several years as a Quartermaster-Sergeant with the Royal Fusiliers, Kings Own Yorkshire Light Infantry and the Manchesters. 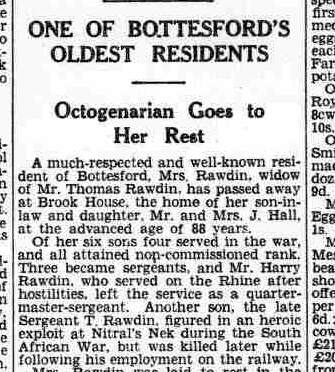 Harry Rawdin, born 1885 in Bottesford, was the second son of Thomas Rawdin, born 1848 in Bottesford, and Sarah Rawdin, born 1851 also in Bottesford. In 1891, Thomas was a canal labourer and the family were living on The Green, Bottesford, where they remained until after the 1911 Census. The children at home were Sarah (13), Frank (11), Harry (5), Rose (3) and Frederick (1). His younger brother, Fred, served in the army in WW1. In 1901, Harry was 15 years old, employed as a clerk for a coal merchant, and younger sister and brother, Rose and Frederick Cecil, were still at school. Then, in 1911, Harry was the only son living at home, employed as a clerk for a catering business. Apart from the information on the Bottesford Absentee Voters list, no online service records have been located so far for a Harry Rawdin, born in 1885. “It is the 53rd Young Soldiers (YS) Battalion (BN) Training Reserve (TR) Northumberland Fusiliers (NFS). 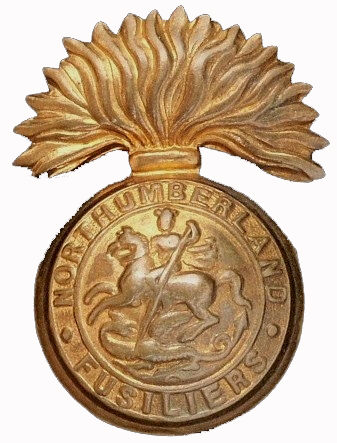 The 5th Young Soldier Bn, Training Reserve, became the 53rd (Young Soldier) Bn, Northumberland Fusiliers on 1/11/17. These battalions were eventually re-organised as ‘Service’ Battalions and went on to serve with the Rhine Army in 1919. Thanks to Jonathan’s help, we can identify Harry Rawdin as Sergeant 5/16405, 53rd Battalion, Northumberland Fusiliers, with regard to his wartime service. He was thus engaged primarily in training new troops within the UK, until after the end hostility the battalion became part of the Rhine army. Post-war records confirm that he continued to serve in the army, transferring by 1921 to the Royal Fusiliers (see below). After the end of WW1, Harry Rawdin re-enlisted, and he appears in successive annual Absent Voters lists from 1921 to 1927. All the records are for Bottesford polling station, giving The Green has his home address. They indicate that he served in three regiments during this time, achieving the rank of Quarter-Master Sergeant and then Lance-Lieutenant. In 1921, he was recorded as Rawdin, Harry, The Green, 6451092 SQMS (Sergeant-Quartermaster), Roy Fusiliers. The record from 1925 indicates that he had been transferred and was 6451092 L/Sgt (Lance-Sergeant), 1st Btn, KOYLI (probably King’s Own Yorkshire Light Infantry). In 1927, it changed again, to 6451092 L/Sgt, 1st Btn, Manchester Regiment. A soldier called Harry Rawdin married at Wiesbaden, Germany, in 1927: the record does not include his spouse’s name, nor does it confirm that this is the man from Bottesford though this it quite possible that it is. He is mentioned in the Grantham Journal in 1937 and 1938, notably in his father, Thomas Rawdin’s obituary, reported on the 29th May, 1937, and had evidently returned to civilian life in the Bottesford area. Information from the General Register indicates that a man named Harry Rawdin died in Wandsworth in September, 1947. If this is the Harry Rawdin who came from Bottesford, then he would have been aged 62. However, it is a surprise to find that he should have died in London, and so we would like to find further information to confirm that this was the case. We lack information regarding his Medal Honours, and would prefer confirmation of the date and place of his death.